Father and Son - - 1945, Lithograph. Cole 10. Edition 250. Signed and numbered 44/250 in pencil. Image size 9 5/8 x 11 3/4 inches (244 x 298 mm); sheet size 12 x 16 inches (305 x 406 mm). A fine, rich impression, on off-white wove paper, with good margins (1 to 2 inches), in excellent condition. Published by Associated American Artists, New York. Printed by George Miller. 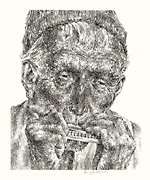 Music - - 1951, Lithograph. Cole 22. Edition 250. Signed in pencil. Image size 10 x 8 inches (254 x 203 mm); sheet size 12 5/16 x 10 1/8 inches (313 x 262 mm). A fine impression, on white wove paper, with margins (1 to 1 1/8 inches). Published by Associated American Artists. Printed by George Miller and Son. 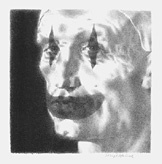 Clown's Face - - 1961, Lithograph. Cole 41. Edition 30. Signed and numbered 17/30 in pencil. Image size 10 1/2 x 9 1/4 inches (266 x 235 mm); sheet size 16 3/8 x 13 inches (416 x 330 mm). A fine impression, on cream wove paper, with full margins (1 3/4 to 2 7/8 inches), in excellent condition. Printed at the Art Student's League for their benefit sale. 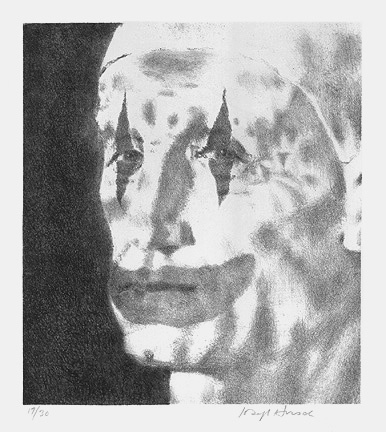 Painted Man - - 1963, Lithograph. Cole 42. Edition 250. Signed in pencil. 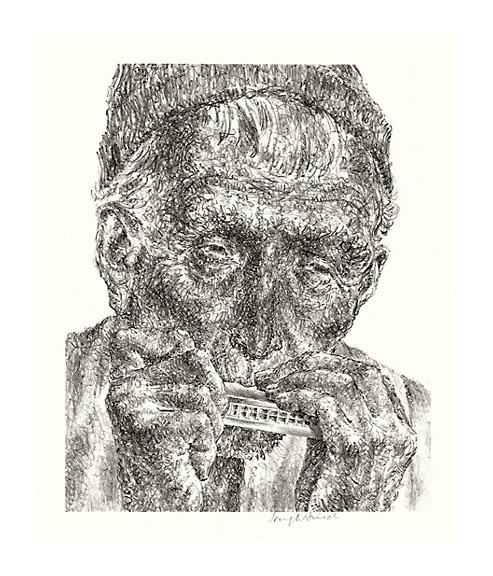 Image size 9 3/8 x 9 1/8 inches (238 x 231 mm); sheet size 14 7/8 x 13 inches (378 x 330 mm). A fine impression, on cream wove paper, with full margins (2 1/8 to 3 1/8 inches), in excellent condition. Published by Associated American Artists, New York. Printed by Burr Miller.